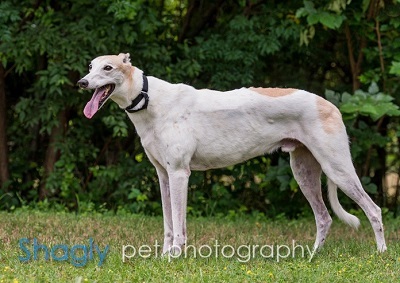 Brady, aka Thatza Your Turn, is a handsome 11-year-old white and red male born March 24, 2004. His sire is Flying Penske, and his dam is Chili Water. There are no races to Brady's credit on Greyhound-data.com. Brady was in a home for several years with Sophie. The previous adopter had to move, and the adoption group Brady was originally from is no longer in business. A good Samaritan took both greyhounds into her home, but was not in a position to keep them. So GALT was asked to take Brady and Sophie into our family. 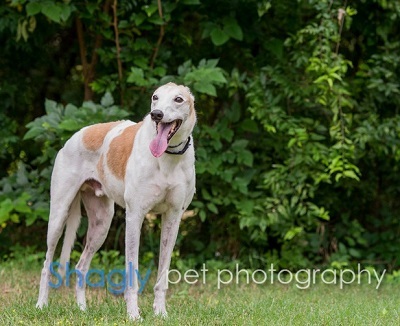 Brady is a very affectionate boy and enjoys the company of other greyhounds. Brady is cat and small animal tolerant. Sadly, after four years in a home, Brady has been returned due to financial difficulties and is once more looking for a family.